I spent some time tonight looking at old pictures. They weren’t really so old, just three years ago. July 3, 2009. My dad looked so happy, and yet he would only be with us for a few short months longer. I’m glad we didn’t know. I’m glad it was sudden. That July 3, 2009, his last July 3, he was happy and surrounded by his family. Our town celebrates Independence Day on the Third of July. It begins with the community band playing patriotic selections in a church parking lot followed by an ice cream social. Later, the celebration would move to my parents home for dinner. Mom and Dad always invited my family and T’s larger, extended family. On this one day, my parents’ home was filled with kids, grandkids, and in-laws. Dad grilled up burgers and brats, and filled big washtubs full of icy drinks. Everyone pitched in and brought all the traditional summertime favorites. At dusk, everyone would troop down to the corner for the lighted parade. All of that was followed by the community fireworks display. Mom and Dad’s house had one of the best views in town, and we would all line up our lawn chairs in the back yard. It was one of my dad’s favorite days of the year. He went all out for this patriotic celebration. 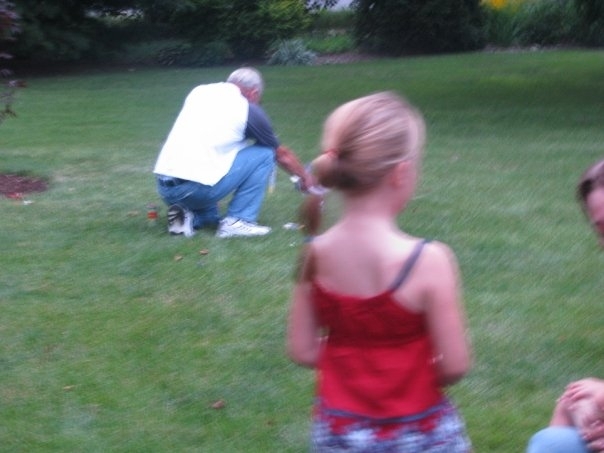 He loved fireworks, and always made sure that there were plenty of firecrackers and bottle rockets for his grandsons to shoot off across the backyard. Each year, the celebration grew. More people packed in my parents’ backyard as the kids grew older and brought along their friends. 2009 was the last year. Dad called me a few weeks before the 4th and told me that he wasn’t sure if they would be able to handle the celebration this year. Mom was too sick. He was so disappointed by the thought of letting everyone down, and he didn’t want to miss out on the fun. I told him not to worry. I would be happy to do all of the work. All they had to do was relax and enjoy the day. Thank God. Thank God that I took the time and made the effort that year. I took the day off work, and Em and I did all of the cooking and preparations. I dropped it all off on my way to play in the band. Three of the kids and I all played in the band that day. My only regret now is that I didn’t stay with my dad every moment. Tonight, I looked back at the pictures we took that night. Dad was in the yard lighting bottle rockets. Dad was smiling at Lola and my little nieces as they waved sparklers around in the dark. Those were such happy times, and I miss my dad so much tonight. We haven’t been able to celebrate the 3rd of July since that year. Like me, the kids can’t, aren’t able, to watch the fireworks display in our town. Since 2009, since Grandpa has been gone, none of us can bear to watch those fireworks shooting up from the high school football field. It isn’t the same. It will never be the same, and we don’t seem to be able to figure out a new tradition. As T and I walked tonight, we broached the subject. Where will we watch fireworks? Will we watch fireworks? I asked him if he thought I could do it this year. I asked him if he thought I would be able to sit in my parents’ yard and watch the show without getting upset. He said, “No.” That was it. Just no, and I knew he was right. Luke is going to go camping out of town on purpose to avoid the memories. He told me. Andrew is no longer home, and I hope that he has a wonderful celebration in his new city. Emily has already made plans to go to a celebration in another town; also to avoid missing Grandpa. That leave just T and I to figure out how to make this an enjoyable celebration for Lola. I had a great-aunt Thelma who missed her mother intensely. As a little girl, I’m not sure how I really knew that, but I did. It amazed me as the years passed how often she lovingly spoke of my great grandma. I understood it, because she had been a wonderful woman, but I was always taken aback by her continued sadness. I wondered why she hadn’t eventually “gotten over” her mother’s death. Years later, when Aunt Thelma died, I imagined her happy reunion with Great Grandma, and even while I mourned the loss of my aunt, that thought made me smile. Now, all these years later, I understand Aunt Thelma. I miss my dad so very, very much.